The Pomona Fairplex is, basically, the birthplace of hot rodding in Southern California, so it is no surprise that the 70th annual O’Reilly Grand National Roadster Show, held January 25-27, displayed one of the best fields of cars competing for America’s Most Beautiful Roadster honors in recent recollection. 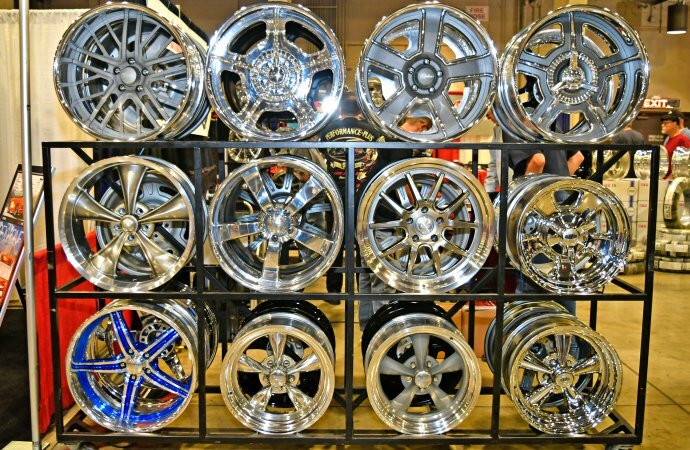 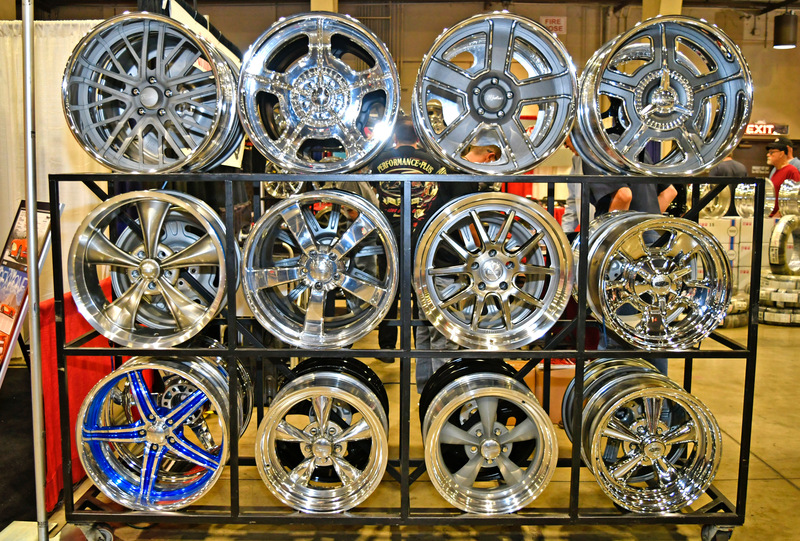 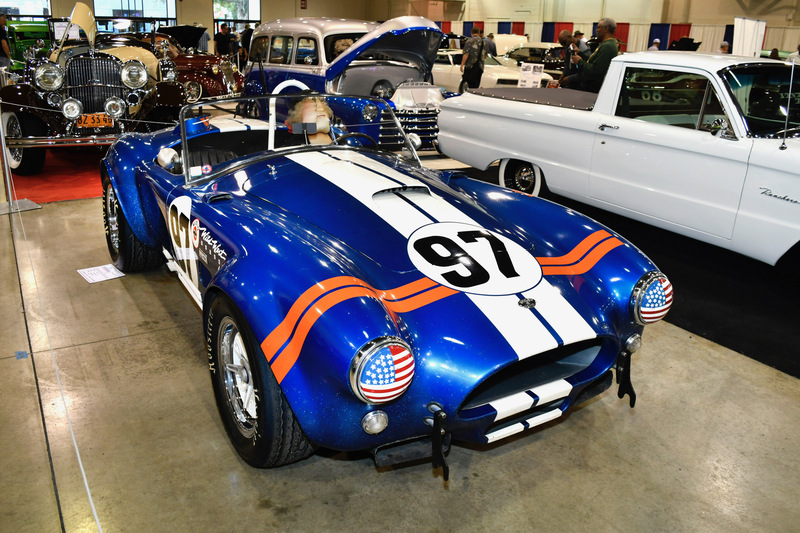 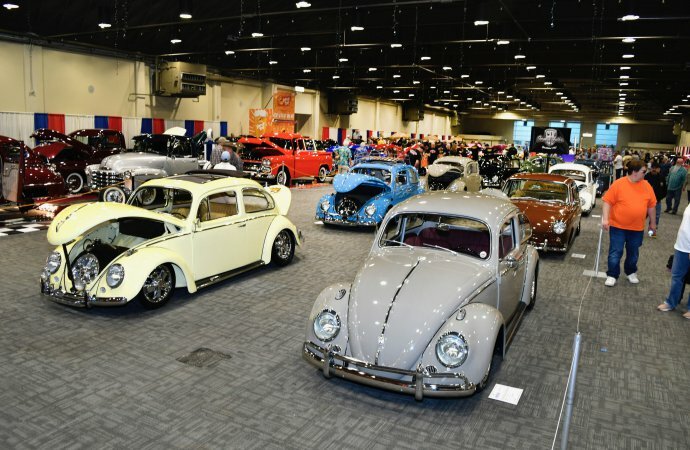 The show roared into town with the most spectacular roadsters in the country vying in a three-day beauty pageant of hot rods, roadsters, customs and motorcycles. 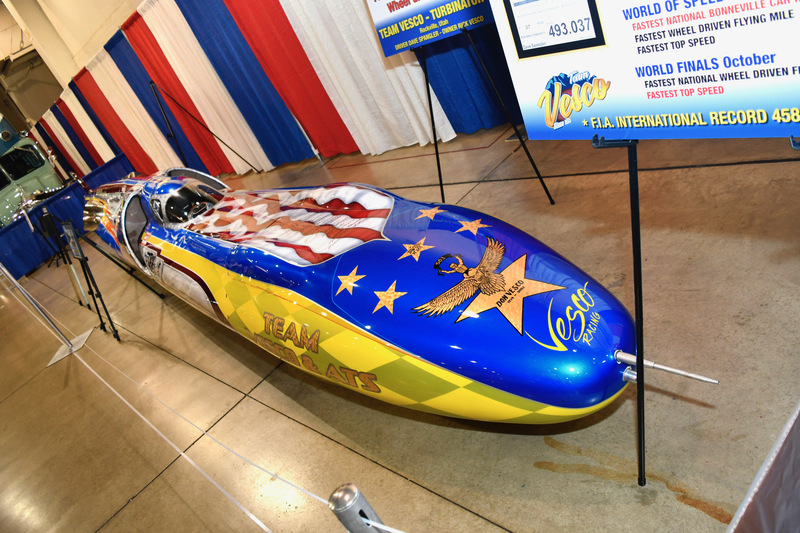 The show is the “Granddaddy of Them All” and is the world’s longest-running such indoor. 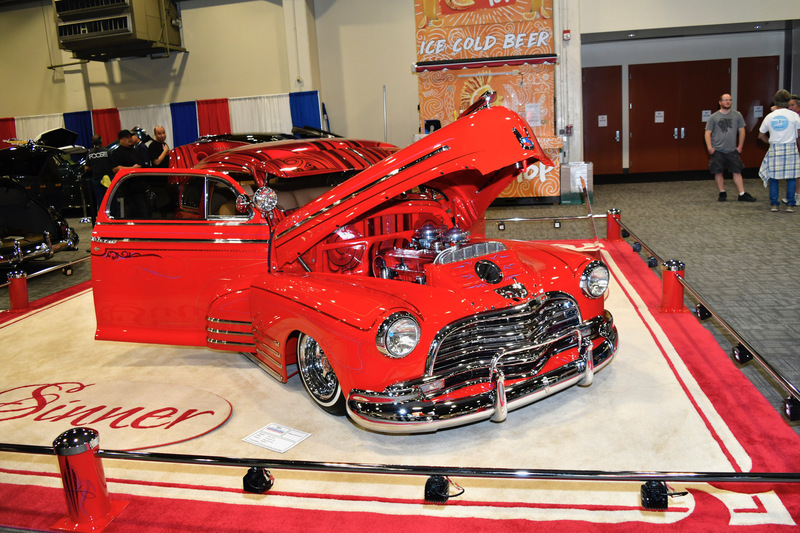 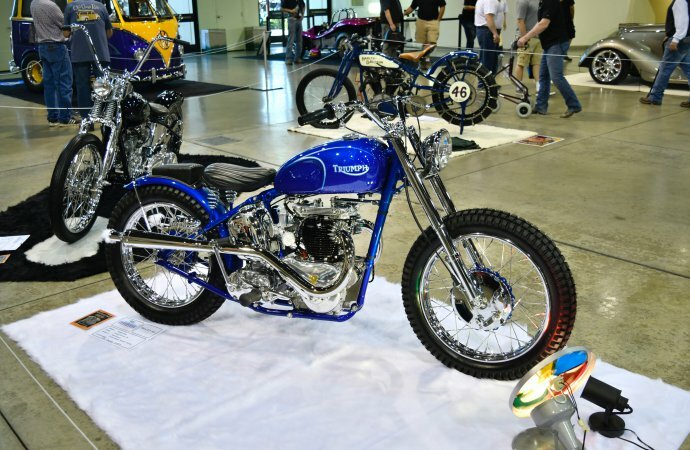 This year it showcased more than 1,600 vehicles competing for 500 awards. 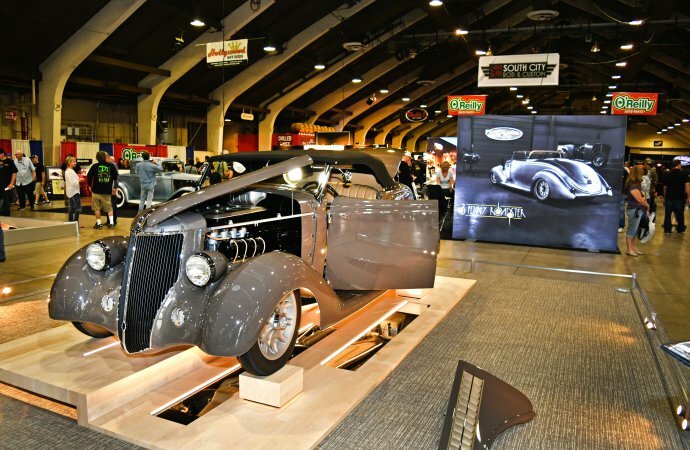 The epic event was founded in 1949 in Oakland, California, by Al Slonaker and moved to the Fairplex in 2004. 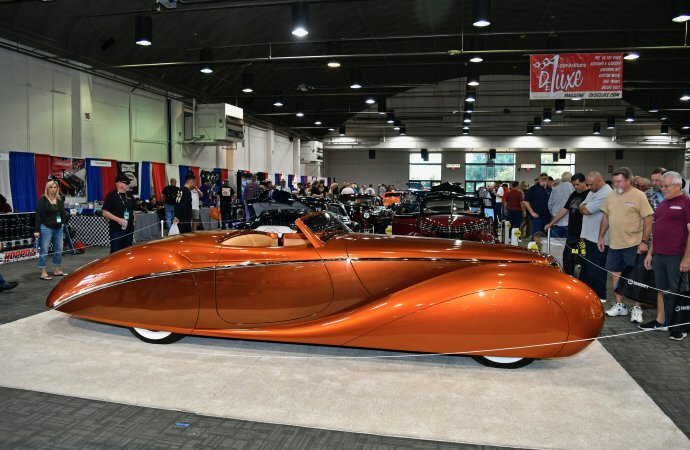 For 70 years, the most-beautiful title is the one that the major builders and creative designers want to win, and results in having their names added to the 9 1/2-foot “perpetual trophy” along side the legends of the sport, including Gejeian, Immerso, Buttera, White, Coddington, Foose, Barris and others. 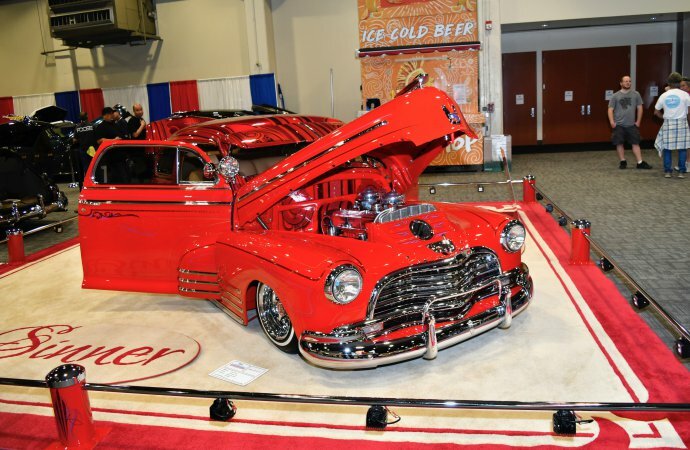 Chip Foose was honored as “Builder of the Decade” in a ceremony Sunday evening. 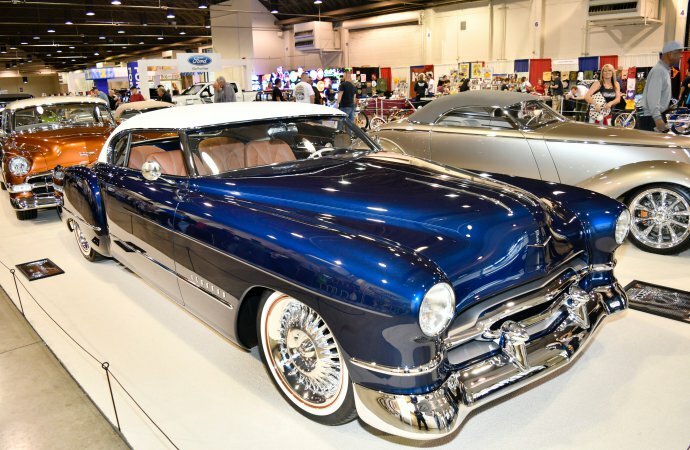 Foose worked with noted hot-rod builder Boyd Coddington and then founded his own shop in 1998. 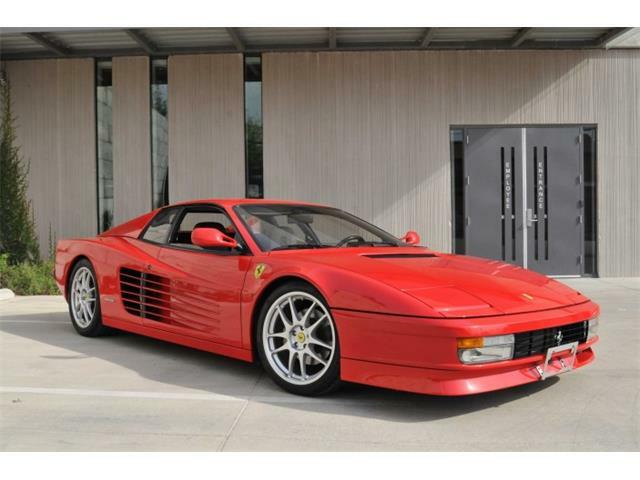 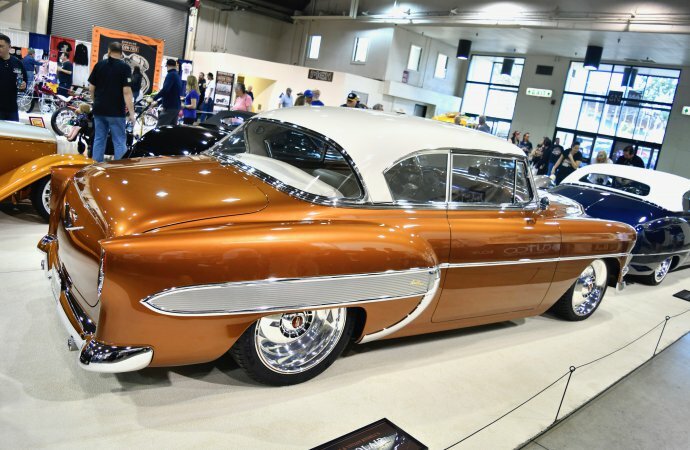 His hit TV series, Overhaulin’, ran for nine seasons. 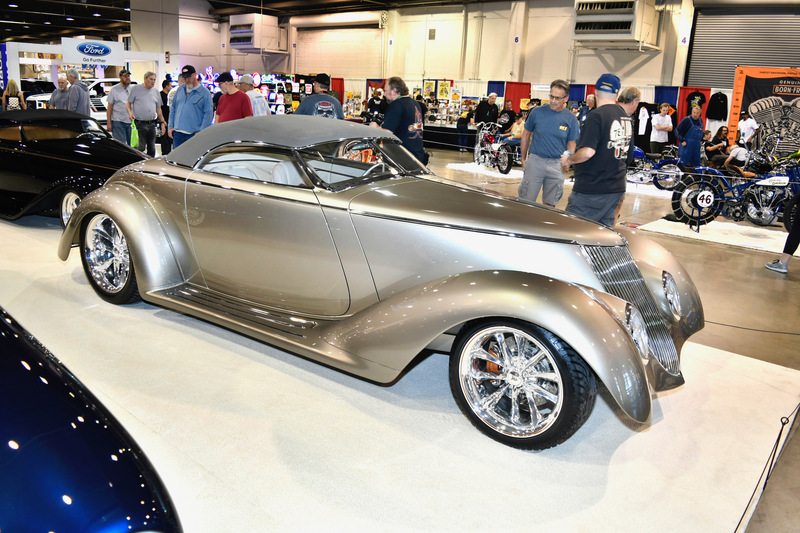 Foose has built and designed vehicles that have won eight AMBR titles. 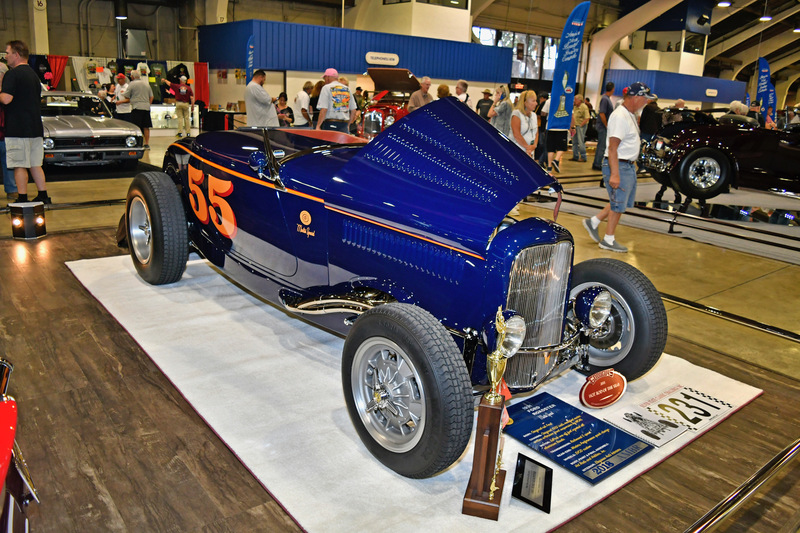 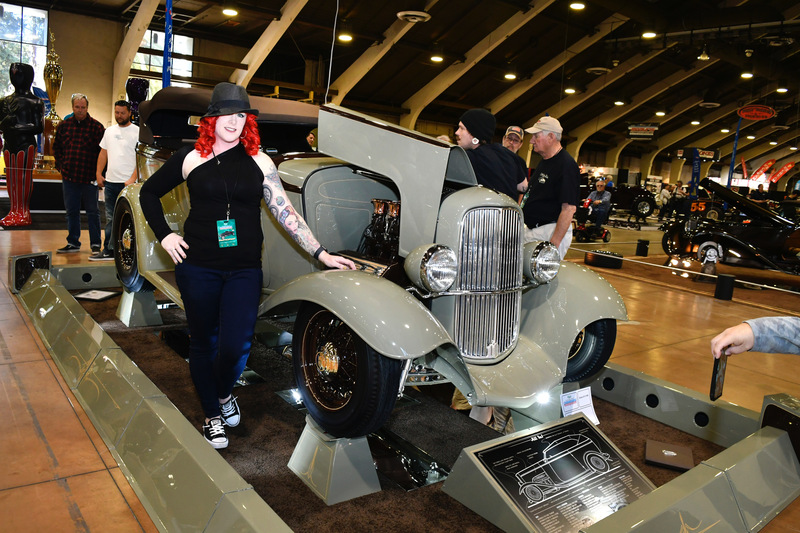 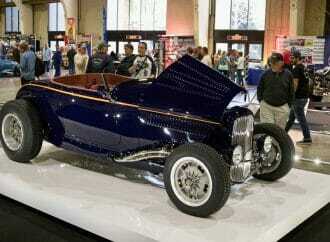 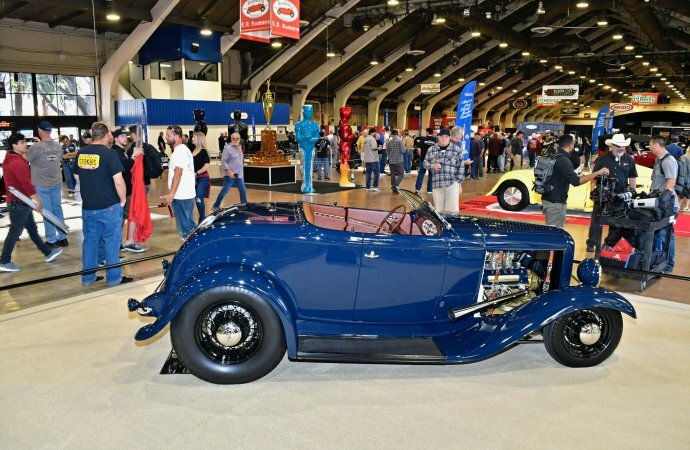 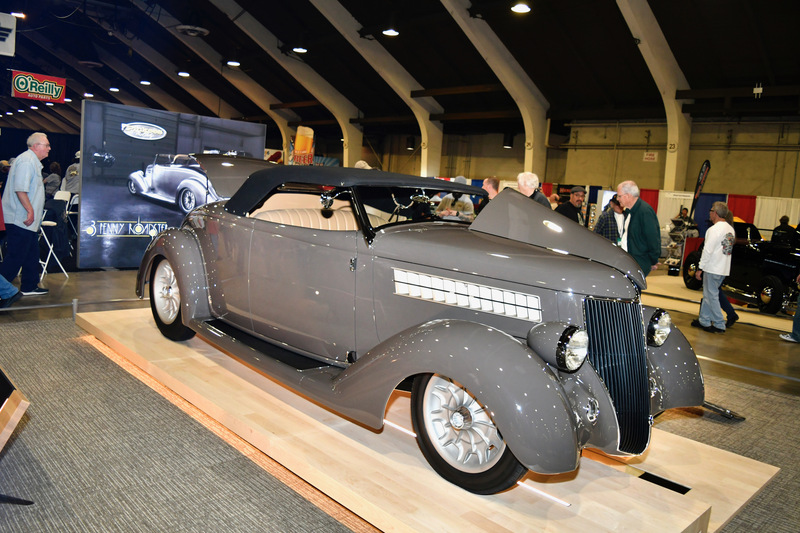 About a dozen of his automotive creations were on display this year, including t a 1932 Ford named “0032” (AMBR winner in 2000) and a 1936 Ford named “Impression” (2006 winner). 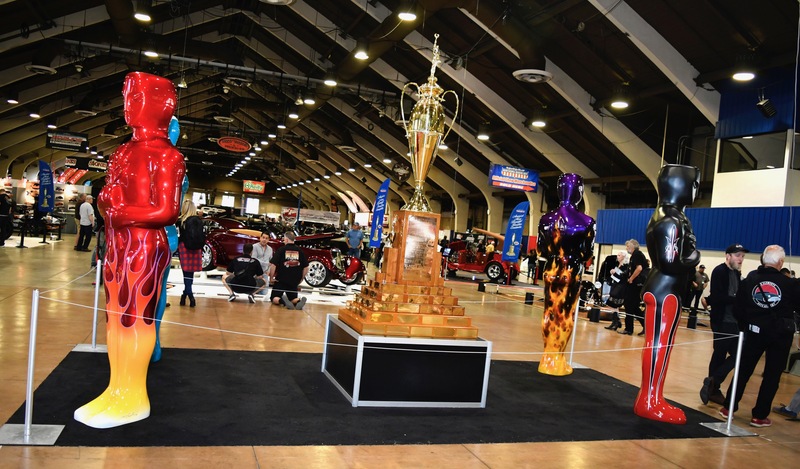 The Grand National Roadster Show Hall of Fame, established in 1960, inducted induct four new members this year. 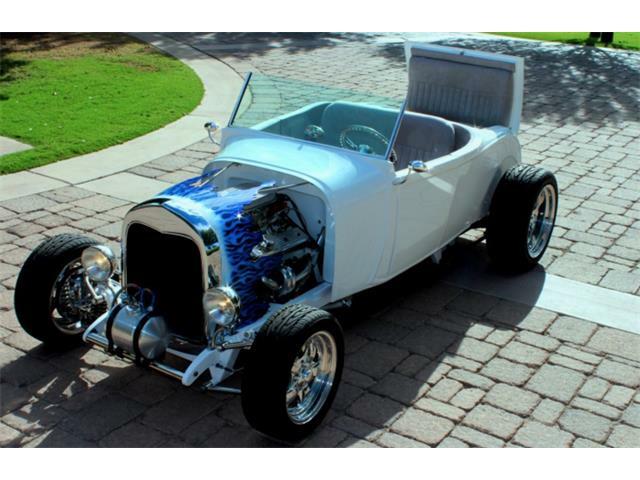 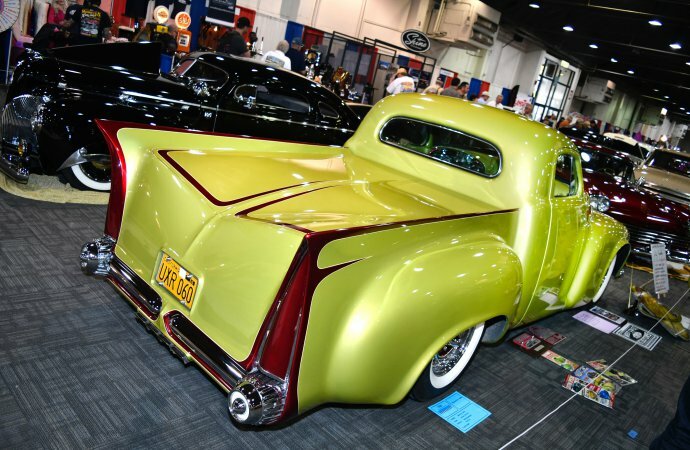 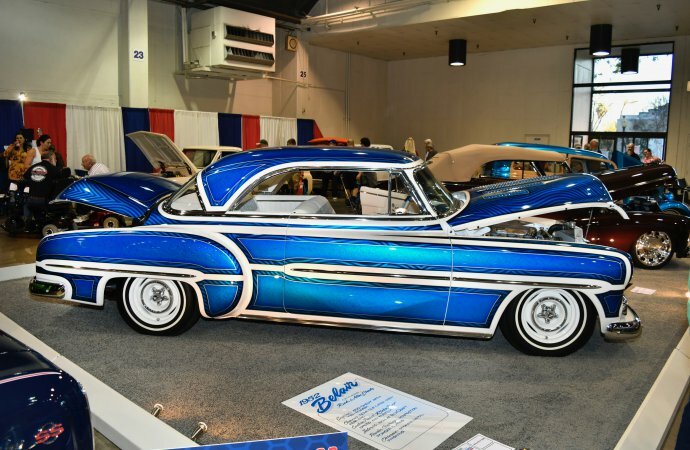 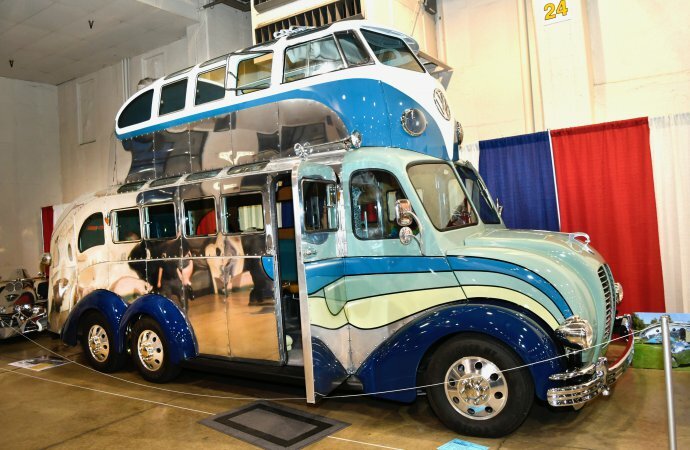 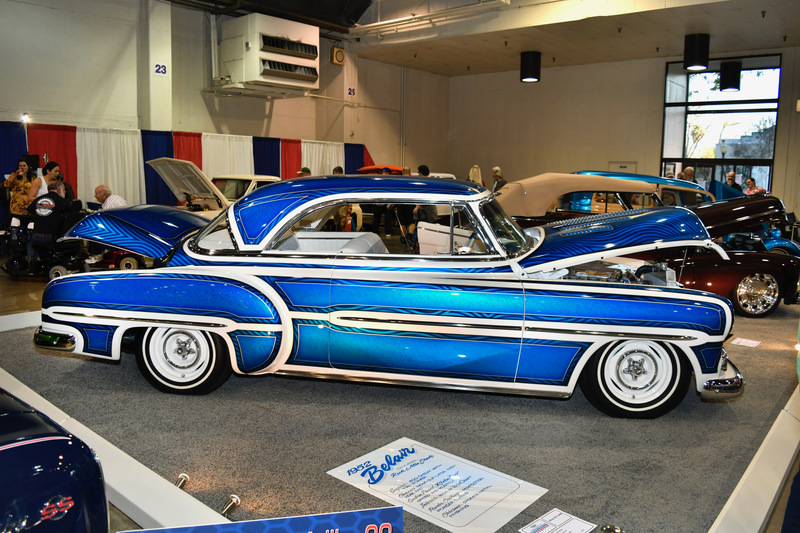 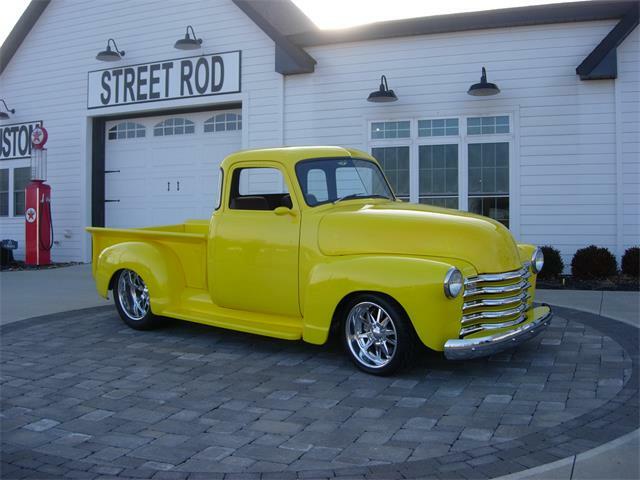 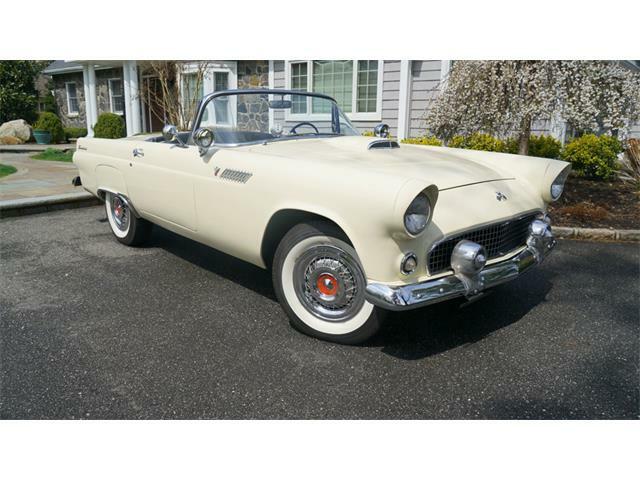 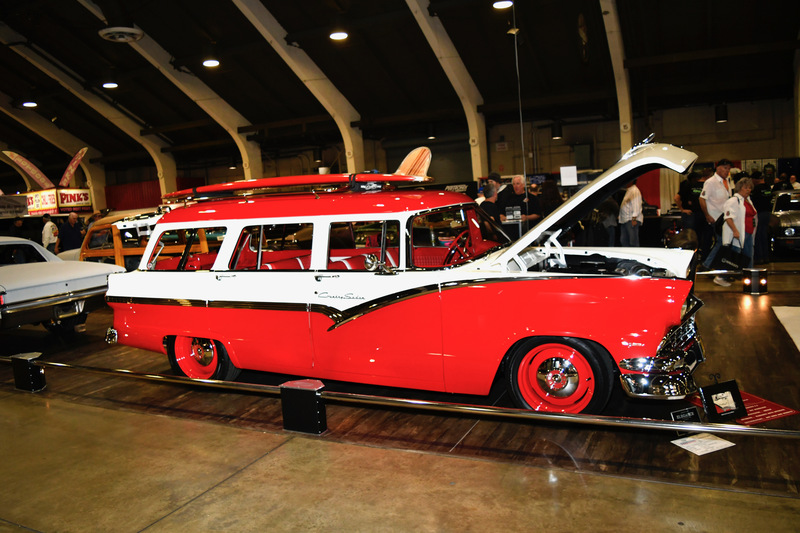 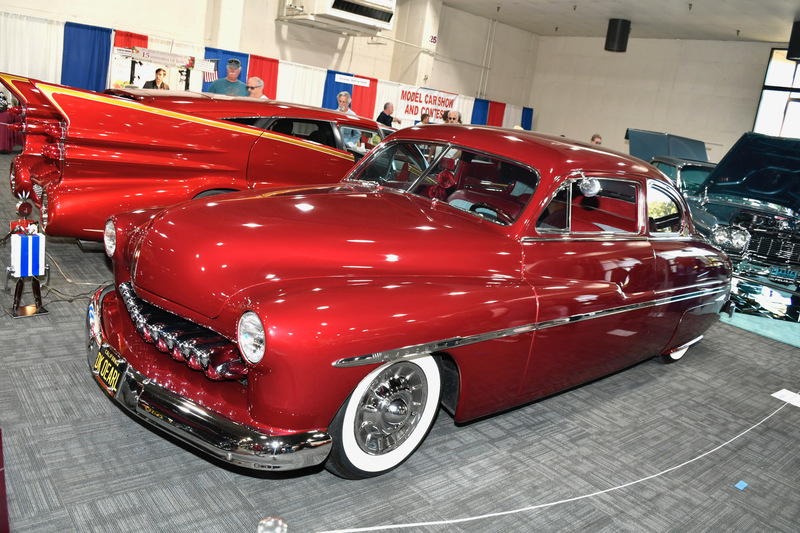 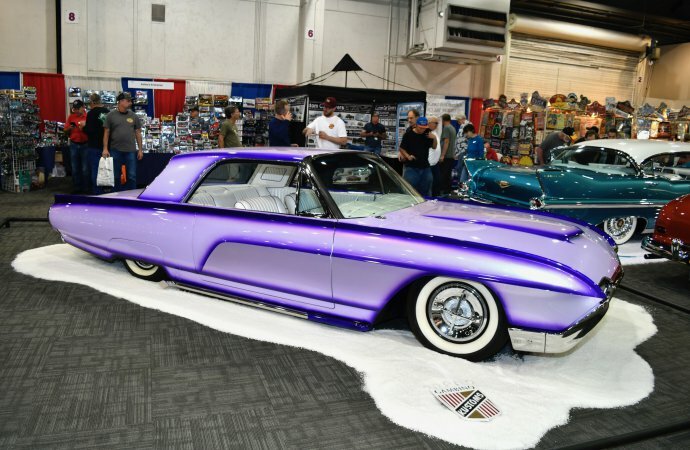 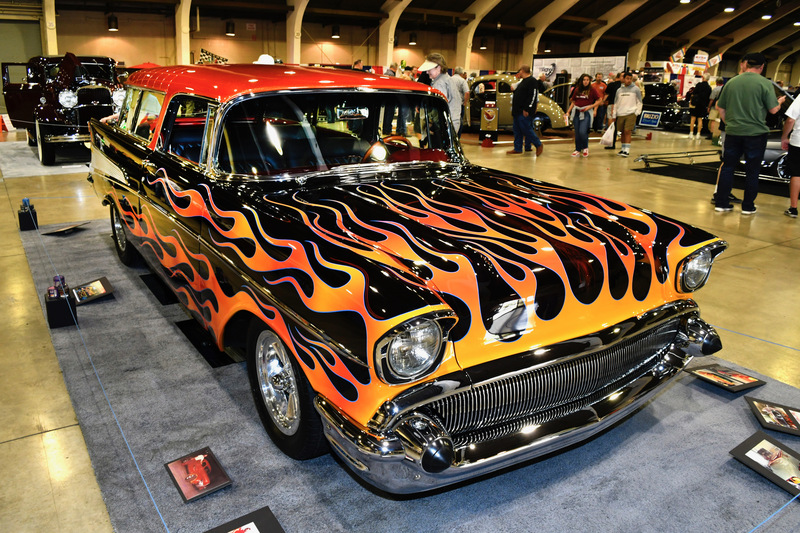 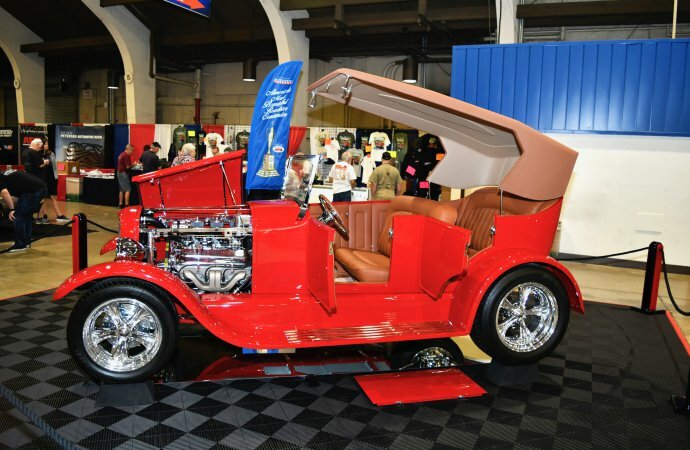 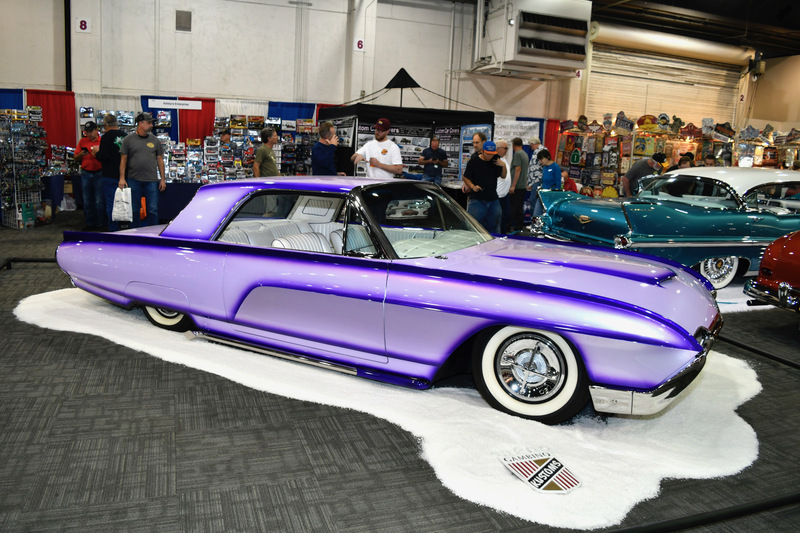 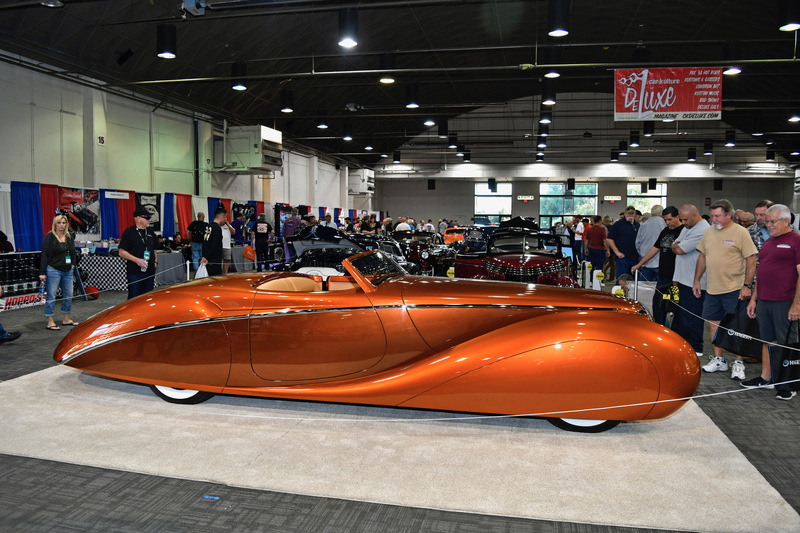 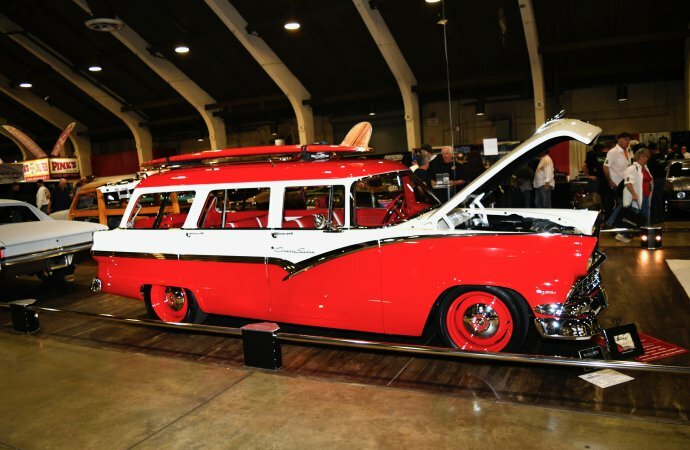 They were pin striper and “Kustom Kulture”artist Tom Kelly, painter Pete Santini, upholsterer and interior builder Ron Mangus, and customizer Bill Ganahl. 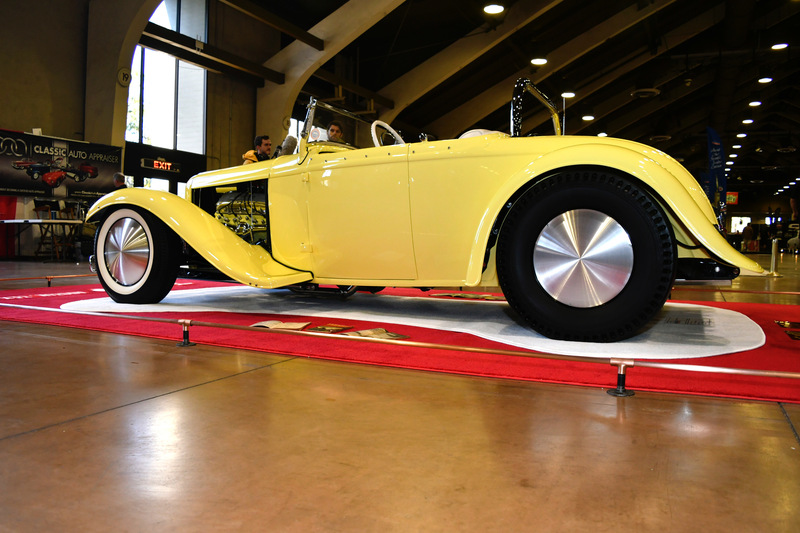 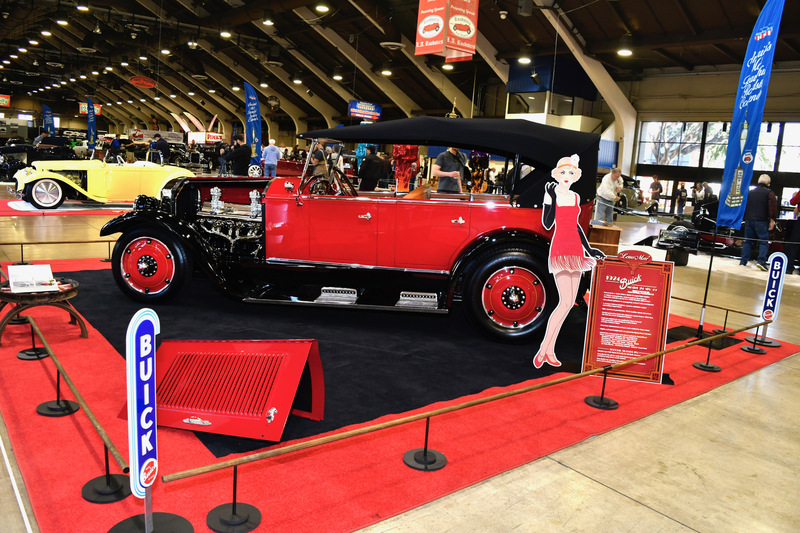 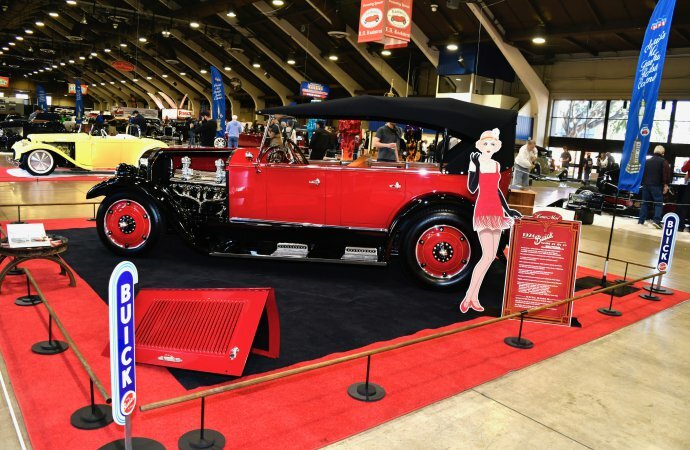 Special exhibits at the show this year included the “90 Years of the Ford Model A,” Bonneville and HHRA record-holding vehicles. 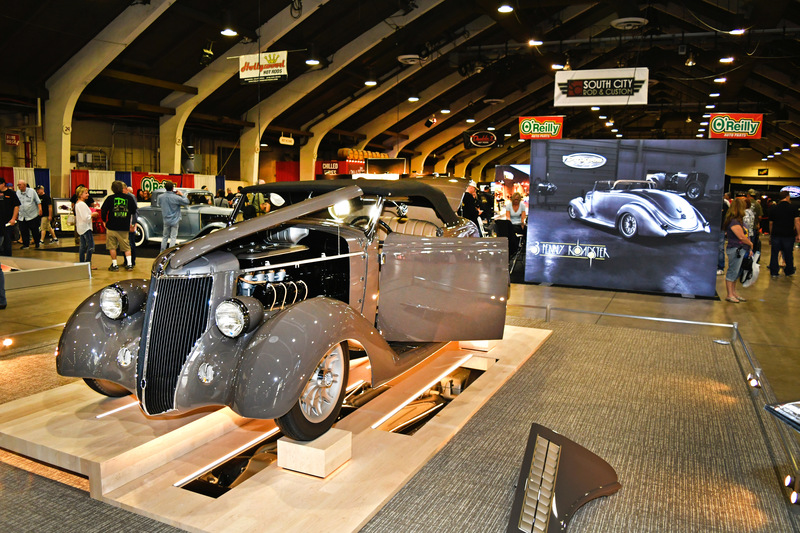 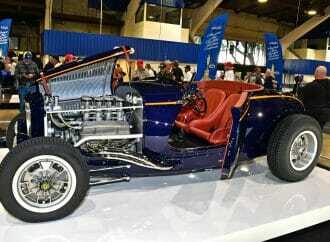 There were also a variety of car club showcases as well as manufacturers and vendors offering up their latest goods. 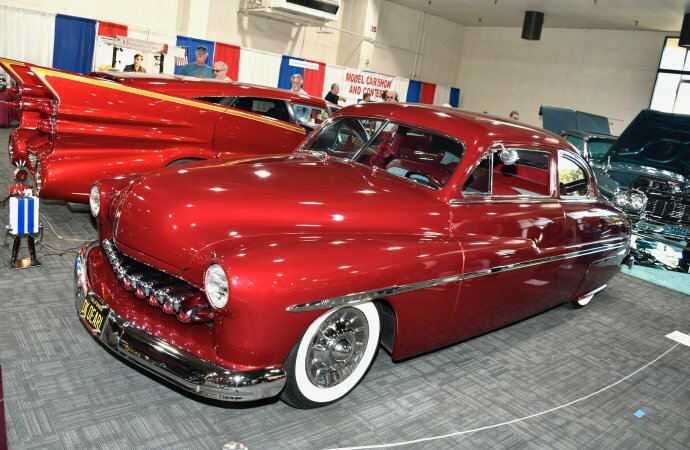 By Sunday evening the tension was at its height with guessing which from a pool of 13 finalists would win bragging rights and the $10,000 check that comes with the most-beautiful award. 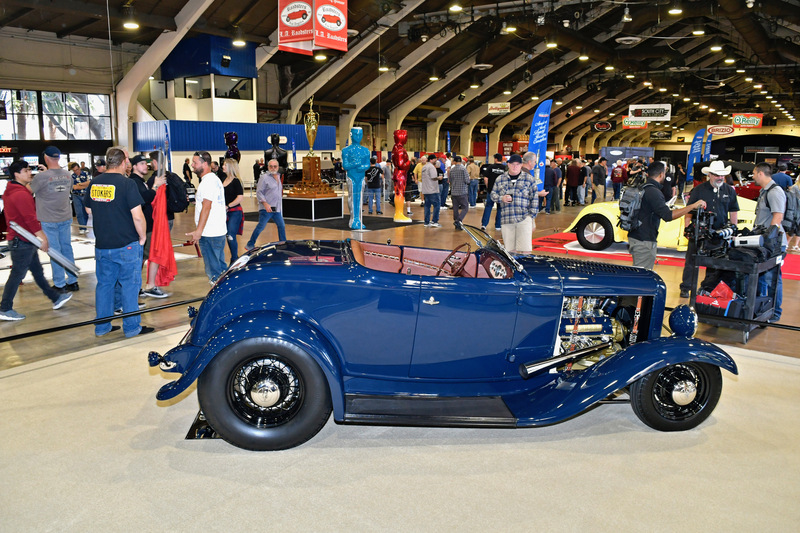 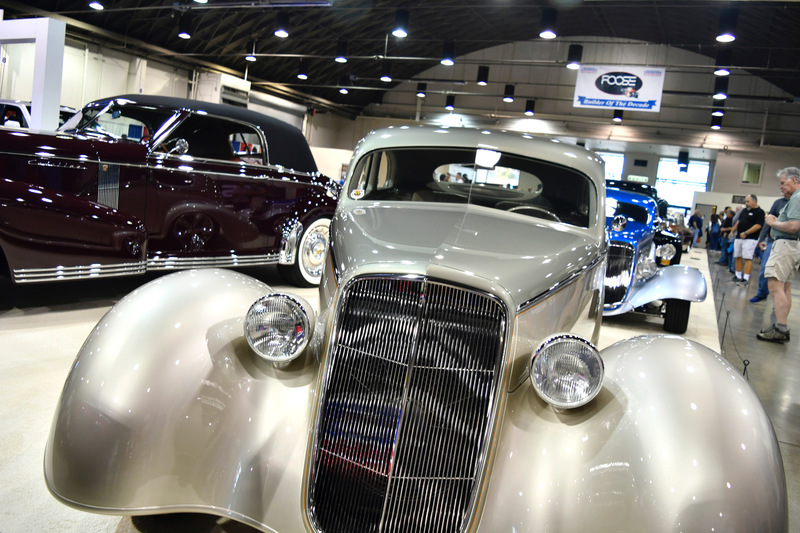 The winner was George Poteet’s ’36 Ford — “3-Penny Roadster” — built by Pinkee’s Rod Shop in Windson, Colorado. 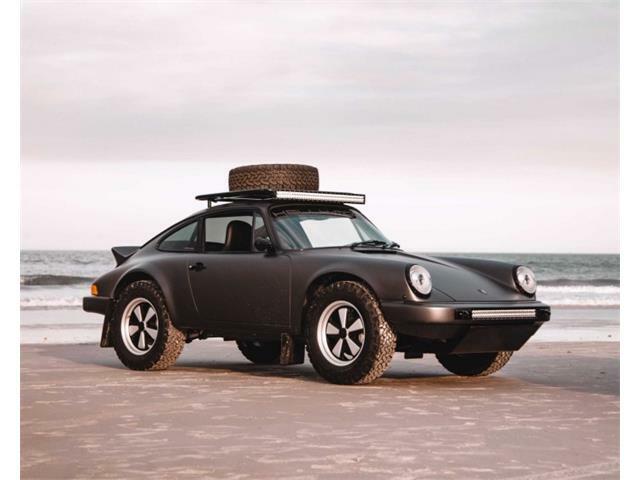 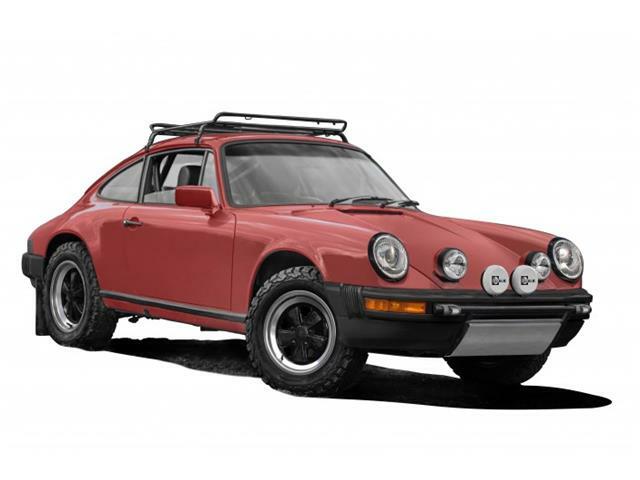 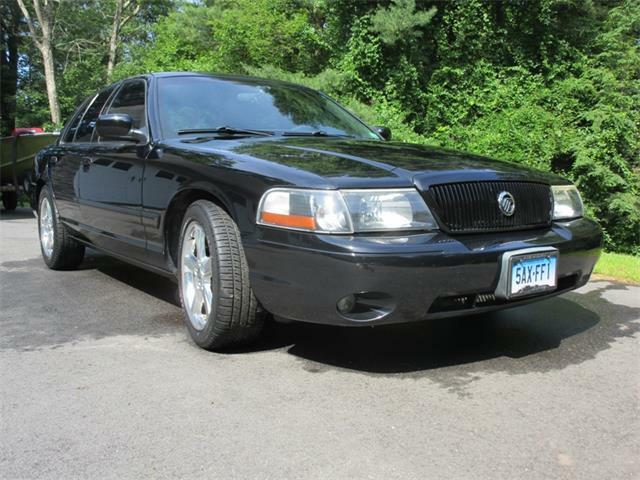 Named for the price of chocolate milk in Poteet’s youth, the car is finished in light brown color and is powered by a fuel-injected 351 Windsor V8, mated to a Tremec TKO five-speed transmission. 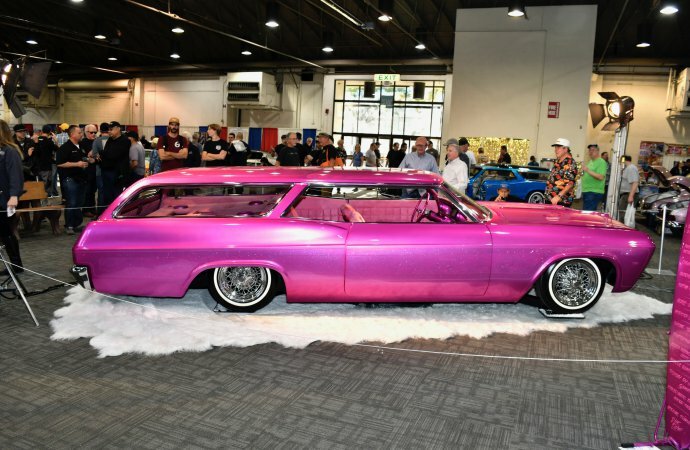 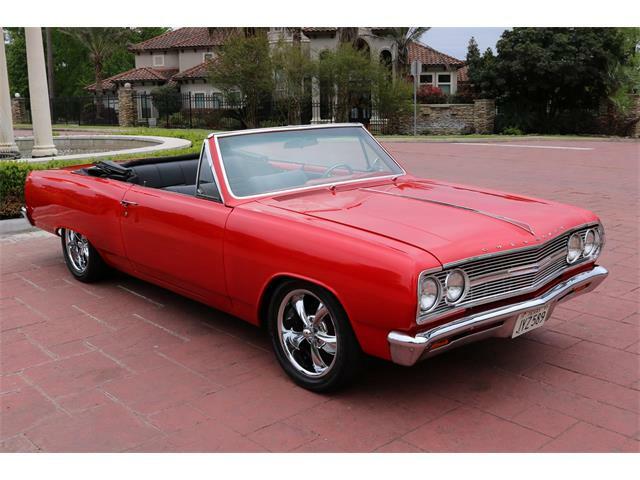 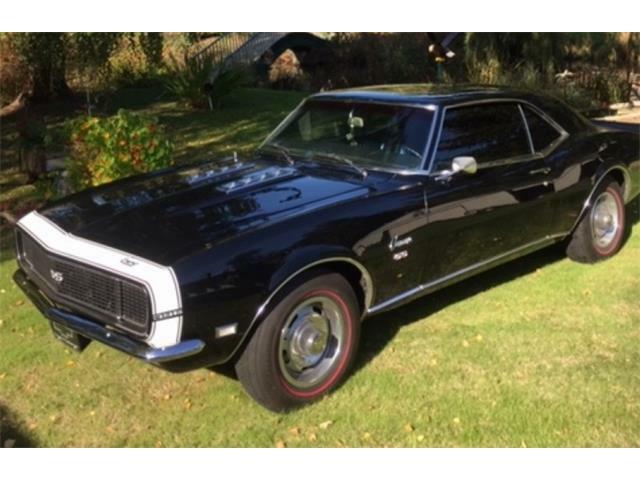 Among other award winners were Scott Cooper’s 1970 Chevy El Camino (best truck), Johnny Martin’s 1957 Chevy (Al Slonaker Award), Tony Wood’s 1967 Ford Thunderbird wagon (the George Barris Memorial Kustom D’Elegance Award), Kevin Anderson’s 1947 Cadillac (John D’Augostino Award), John Mumford’s “ALa Kart,” a 1929 Ford built by George Barris (Bruce Meyer Hot Rod Preservation Award). 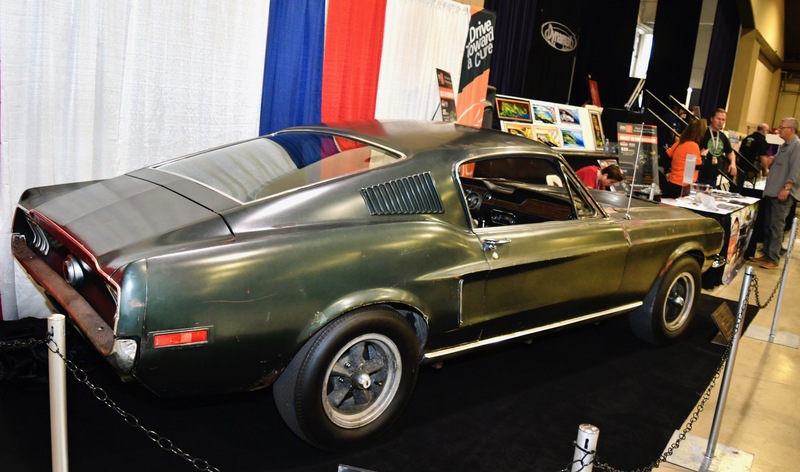 As a special treat, the original 1968 Ford Mustang that Steve McQueen drove in the film Bullitt was on display and drew attention to a one-of-a-kind BRM watch commemorating the movie. 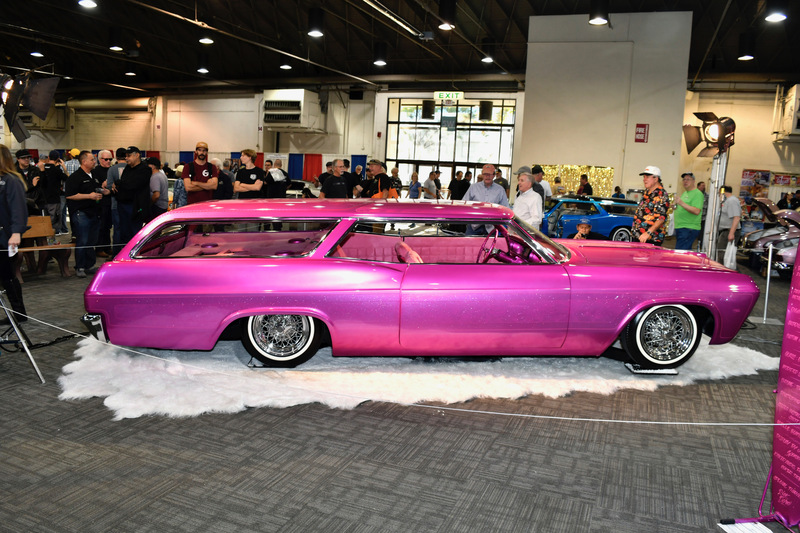 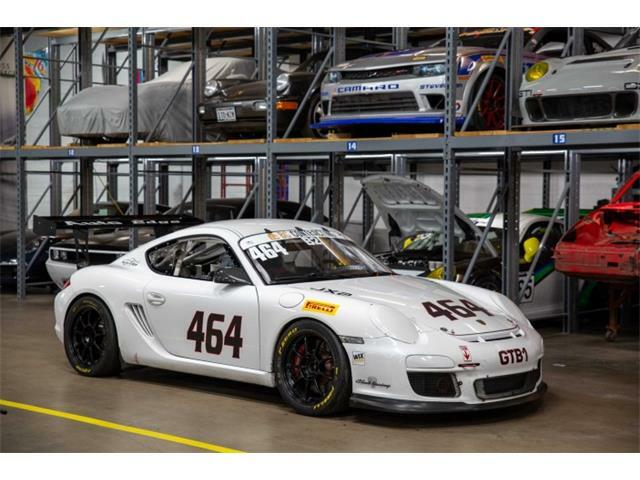 The raffle raised $45,845 for Drive Toward A Cure, a foundation dedicating to curing Parkinson’s Disease.